I feel as if the rutabaga is a neglected vegetable in the US. Countless people pass it on the market shelf and never stop to consider it a possibility for their kitchen. Originally from northern Europe, a cross between the cabbage and turnip, the rutabaga was a common menu item until after the first World War. 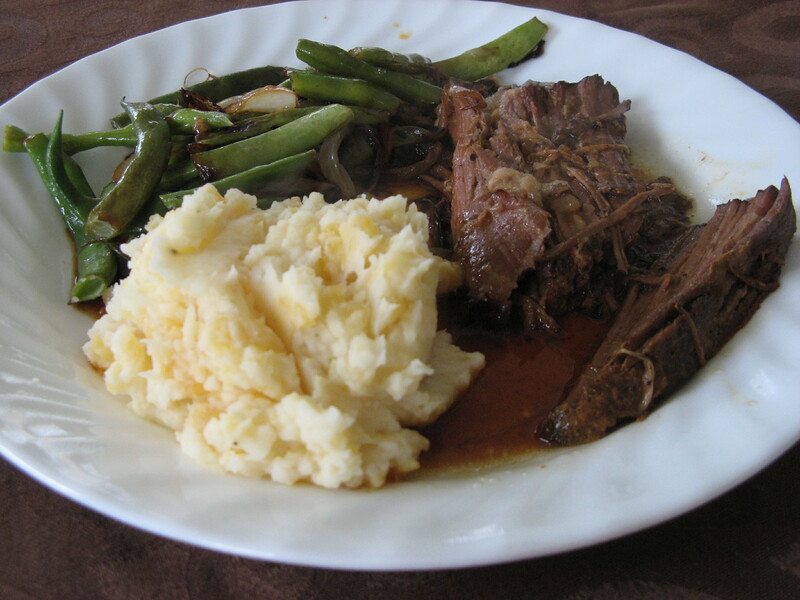 Having been resorted to when there was nothing else to eat, people grew tired of it and it lost its popularity. A shame, really, because nowadays it can add a pleasant change to our normal diets. 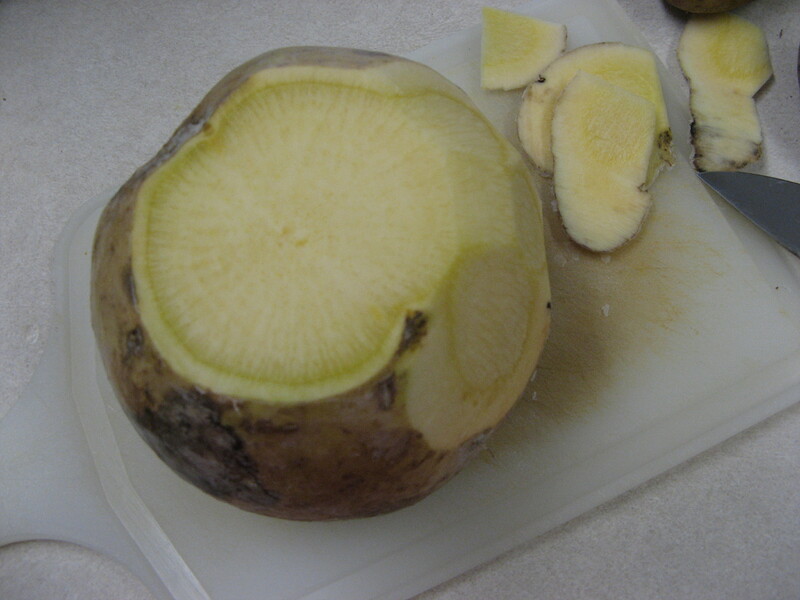 While living in Scotland, I had a greater opportunity to get to know the rutabaga. In the UK, it is known as "swede", short for Swedish turnip. Its use is prevalent in soups and stews and when boiled and mashed is referred to as "neeps" to accompany the national dish of haggis. If you have never tried rutabaga before, the following recipe is an excellent way to begin. Rutabaga, when mashed with potatoes, results in a sublime combination of slightly sweet, slightly tangy that is an excellent accompaniment to the Sunday roast. 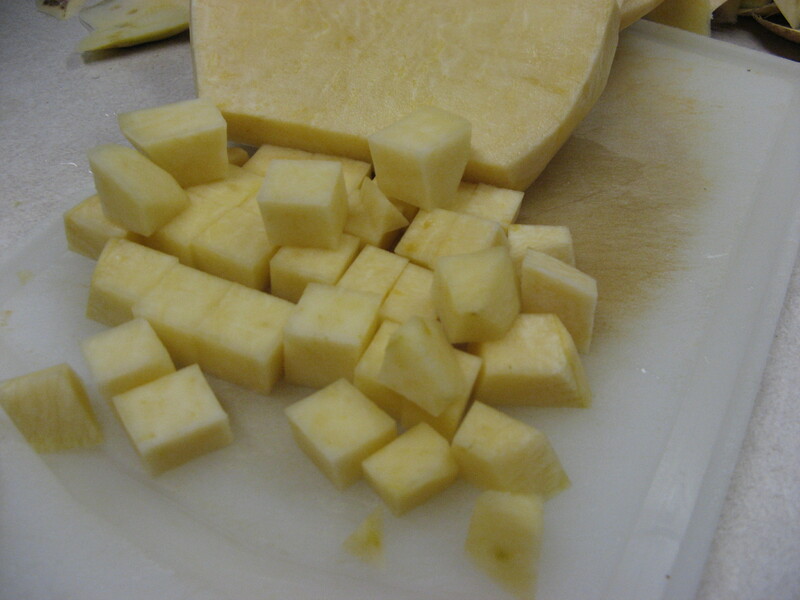 Carefully slice away the outside peel of the rutabaga and then chop the inside into 1/2-inch cubes. Peel and chop the potatoes and combine all the chopped vegetables into a saucepan. Cover with water and bring to the boil. Simmer until all vegetables are tender. Drain. Add some cream (maybe 1/3 cup) and salt and pepper -- or whatever you like to add to your mashed potatoes: butter, sour-cream, etc. we used to serve rutabaga sometimes when I worked at the retirement community. I had never eaten it before, but found that I kind of liked it. :) mashing it with potatoes sounds like a great idea.